Built in 1967 for $3.5 million ($25 million in 2015 dollars), the Parkade was a transformational building for Spokane. With space for nearly 4,000 vehicles, it met the needs of the city during Expo 74, and continued to drive development in the downtown core well into the 1980s. It even included many at-that-time “modern” features, like the skywalks, the entrances, and the sloping floors which have become commonplace in modern parking design. While changes in American automobile buying habits and modifications to the interior of the structure mean that it can now play host to “only” 1,000 cars, the Parkade remains an important anchor to the downtown community. Unfortunately, the same cannot be said of the parking garages and surface parking lots which have been constructed or proposed since the Parkade’s heyday. Instead, we have been given a patchwork of uninviting, drab, and utilitarian pedestrian environments which do nothing to activate public space and sidewalks. In some areas, such as the area near the railroad viaduct, this has resulted in crime and vandalism. In other areas, such as two parcels on the south side of Spokane Falls Boulevard across from Riverfront Park, surface parking has been allowed to fester where catalytic development would otherwise be possible and incredibly impactful. In still other areas, such as West Main at the Davenport Grand, parking garages have paid no attention to the impact that they have on the pedestrian and even the vehicular environment. The following is a list of sites which have seen (or in one particularly distressing case, will see) decreased potential for urban activation and excitement and a depressing pedestrian environment due to improper parking design. And then we’ll look at a solution. 7. Wells Fargo Financial Center. Sure, there are street trees. And maybe a wider-than-normal sidewalk. But this site now has a drab, utilitarian pedestrian environment, and will for many years unless retail fills in the first floor. There’s literally no reason for a pedestrian to be in the area, other than to get to somewhere else. That’s simply unacceptable for our public right-of-way. 6. Davenport Hotel. The fact that Walt Worthy would choose to so disastrously waste his square footage is beyond me. But he did. The self-parking garage for the Davenport Hotel and Tower illustrates a fundamental disconnect: the first floor of a downtown environment should always feature something interesting for pedestrians. It could be as simple as an art installation, but ideally it should be retail. In this case, Worthy abdicates his responsibility with use of public sidewalks. 5. Bank of America Financial Center. The Bank of America Financial Center has, at the very least, some windows on the first floor of its large parking garage in downtown Spokane But there’s still not that much pedestrian activation, and there isn’t much in the way of retail. One side of the structure is more open than the other, despite the fact that only the entrance and exit need be open. And the architectural styling adds no interest to the downtown environment. 4. Rookery Block. When the parking lot is still referenced using the name of the building which preceded it, you know that its destruction was a mistake. There’s some pedestrian interest here that isn’t typically seen on surface parking lots, but at the end of the day, simply recall what the lot replaced. It shouldn’t be possible to tear down a building to build surface parking. But in Spokane, it is. You should know better, folks. 3. Davenport Grand. Can we just admit that it was a mistake to allow Walt Worthy to construct a parking garage without any retail on Main Avenue? Yes, there are windows. And there are meeting rooms on the interior. But you can’t even enter the building from the Main Avenue side. There are doors, but they’re mostly for show, since only employees have access. It’s such a gross oversight that the City of Spokane should be ashamed. Sidewalks are a benefit to projects! Where developers don’t acknowledge that, it is the job of the City to enforce rules and regulations regarding retail. There should be retail along Main. Period. 2. Falls Tower. This is only a proposal right now, and it hasn’t even been submitted for plan review. But it’s worth noting regardless that just about the entirety of this building’s Spokane Falls Boulevard frontage would be comprised of an empty concrete wall. That’s simply unacceptable. Moreover, what’s the point of having the added height on this building in the tower when the parking garage hollows out the urban environment, especially in a growing biomedical campus like WSU Spokane? Just build a mid-rise building that includes frontage on both Division and Spokane Falls, and tuck the parking garage in the hidden southeast corner of the lot. 1. Kendall Yards. Yes. This is the new site plan. Yes. They are seriously proposing a sea of surface parking with islands of office buildings inside it. Obviously, compared to Marshall Chesrown’s original plan for the site, this is a ridiculous step backward. But even compared to Greenstone’s original plans, it’s an step back. This is one situation in which a parking garage (preferably underground) would be preferable. Originally, Greenstone spoke of co-constructing a parking garage with Spokane County, which operates a campus nearby. But clearly that plan’s been tossed in favor of making pedestrians walk through a massive parking lot to access office buildings. I thought that Kendall Yards was supposed to be the ultimate pedestrian-friendly neighborhood, Greenstone? Seriously, just bite the bullet and build a parking garage. Your residents and the Spokane community will thank you later. 1. City of Billings, MT Empire Parking Garage. This is how you construct a parking garage. Streetfront retail, significant architectural interest, lots of glass, and two-toned concrete. There’s even a plant growing up the side of the building at the lower right. The cost might be incrementally more in the beginning, but the long-term pay off is immense in terms of the public benefit. The sidewalk remains a place for people, rather than a place for walking to the next place. And this type of parking garage typically lasts longer as well. Consider that a parking garage with no ancillary amenities becomes dated quite quickly. But one with streetfront retail not only generates greater revenue. It also enables a longer lifespan for the building. 2. San Pedro Squared. In San Jose, there’s this super ugly parking garage on the same block as one of the downtown area’s hotspots: San Pedro Square. It really destroys the vitality of one side of the street. So the San Jose Downtown Association and other groups put together a grant proposal and sent it to the Knight Foundation. The project, San Pedro Squared, will create pop-up retail spots on the ground floor of this particularly large parking garage. The slots will rotate every six months or so, but the energy won’t. In Spokane, this could work in certain areas where parking garages create issues in the pedestrian environment. Because unfortunately, the parking garages, which have already sapped our sidewalks of so much life, will not be going away anytime soon. Of course, those are only two options which could move us beyond our obsession with parking. Or at least make our obsession with parking more bearable in terms of creating spaces which are human-scaled, vibrant, and exciting. But while adapting to our environment would certainly be one path forward, the more exciting possibility is reducing our need for parking in the first place. While many locals scoff at the idea of constructing a residential building without any associated parking, the reality is that in most cities, this forms the basis of a downtown urban environment. It’s a direction in which we must move if we want to stay competitive with the other great urban areas of North America. It’s time to move past cars and toward public transit, walking, bicycling, vanpooling, and ridesharing using services like Lyft and Uber. Spokane should be at the forefront of that revolution, not the chronic laggard that it so often becomes. The City Council, for example, should look at reducing parking requirements downtown. They should ensure that new developments comply with the guidelines and standards for the downtown core zoning area. Local leaders should also look into purchasing lots which have been stagnant as surface parking lots for many years, in effort to entice developers. If parcels cannot be purchased, then a list of property owners should be compiled in order to allow clarity for potential developers. Even mid-rise buildings would be an improvement at this point. Specific sites, such as those across the street from Riverfront Park near Auntie’s and the Bennett Block, should receive incentives for investment and development, especially as the Riverfront Park revitalization kicks into high gear. But perhaps most importantly, they should enforce a moratorium on new parking. We’ve talked about this issue many times before. We have a huge surplus already. We don’t need more, but less. It’s up to our leaders to ensure that we don’t overdevelop our parking supply, but they’re currently failing miserably. It’s not about increasing prices or constricting supply. It’s about ensuring that parking environments work not just for cars, but for the people that they also serve. It’s about building an environment which encourages the use of public transit in order to reduce carbon footprints and reduce the need for parking, which is the least efficient use of space possible in a downtown core. (Imagine the value of that square footage.) Mayor David Condon constantly refers to a desire to fashion Spokane into a “City of Choice.” But being a “City of Choice” requires making choices. Do we want dead urban spaces with no place for human activity? Or do we want a vibrant, exciting downtown environment that welcomes all with open arms and projects a hopeful, positive vision for the future of our community? SHARE YOUR THOUGHTS: What do you think? Is there a space for additional parking garages in the new downtown? Do you think that the obsession with parking is destroying the City of Spokane? And what of that Kendall Yards site plan? 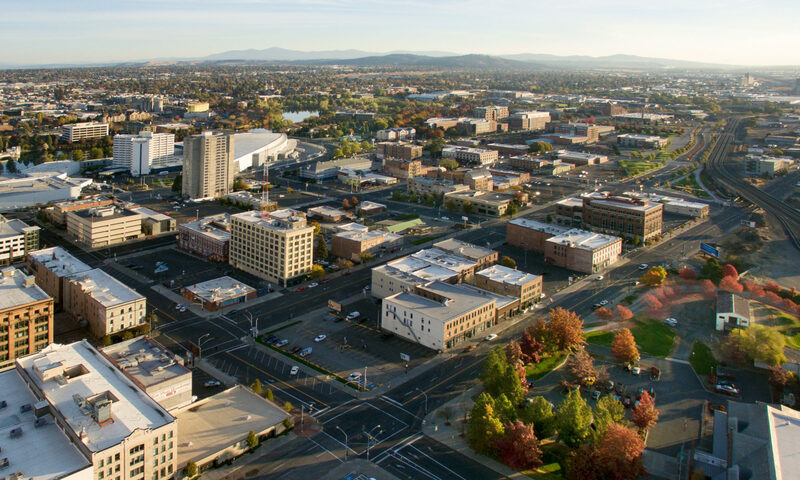 Do you think that the most recent proposal aligns with Greenstone’s vision of the most dense, most pedestrian-friendly neighborhood in the inland Northwest? Share your thoughts in the comments below, on Facebook, on Twitter, or in person. We love to hear from you!